As part of last weekend’s Open House not in London events, I secured a tour of the Shoreham power station. There are in fact two Shoreham power stations to choose from, one nuclear and one gas powered. Sadly for my modest “visiting nuclear things” fetish, I ended up visiting the gas powered station near Brighton and not the former nuclear power plant in the USA. Although the building there now is quite modern, the area is home to one of the earliest power stations in the UK, when in 1882 Robert Hammond hooked up the existing steam engines in use in an Iron Foundry to a dynamo and started generating electricity. 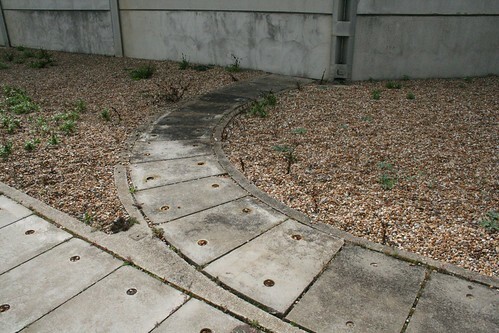 This was used to power sixteen Arc lamps on a circuit around the town centre, operating from dusk until 11pm every day. Over the next few years, the use of the site for generating electricity increased to the point that it became a dedicated power plant and by 1904 what was now called the North Road station was generating 5.9Mw of power. 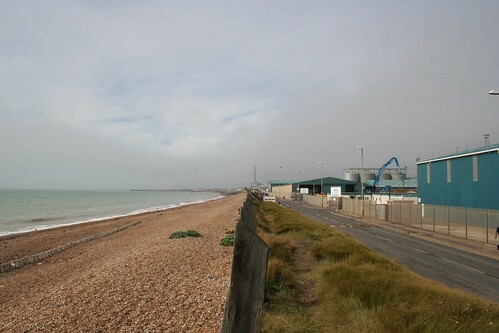 Noticing the increasing demand for electricity, the Brighton Corporation decided to build Brighton A Power Station nearby, and that opened in 1906 and lasted until 1976. However, in 1946 the Brighton Corporation was ordered to proceed with the construction of a second vastly larger power station on the site of the current station, and this coal fired station worked up to 1976, when coal deliveries to the local port became uneconomic. 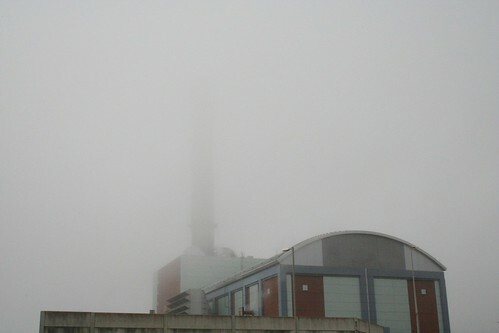 Looking at a photo of the Brighton B Power station might look familiar to us Londoners. However, unlike its local counterpart, the London-by-Sea variant of Battersea Power Station was demolished, with one tower blown up in 1988 and the building taken down, leaving the strange lonely rump of a single chimney remaining on the sea shore. As the tallest structure in the area, it had become a navigation aid – for both sea and air transport. 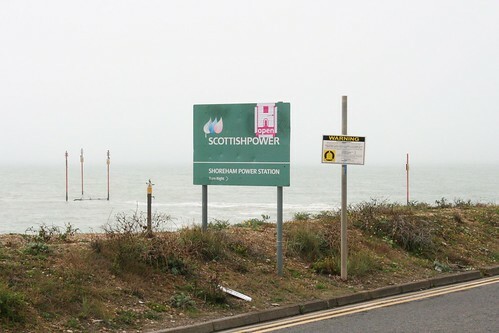 Jumping forward by a decade, and plans were announced to build another power station on the same site, and in 1998 the remaining chimney was blown up and construction started on the current Shoreham by Sea power station. Curiously, the replacement chimney for the new power plant is much taller than it needs to be – because it replaced the old chimney’s dual-function as a local navigation aid – at least, on a clear day it does. The manager who took us around said he would love to lop the top half off as it would save a lot of money in maintenance bills, but then local boats might get lost. The chimney also houses a nesting pair of falcons who return each year. 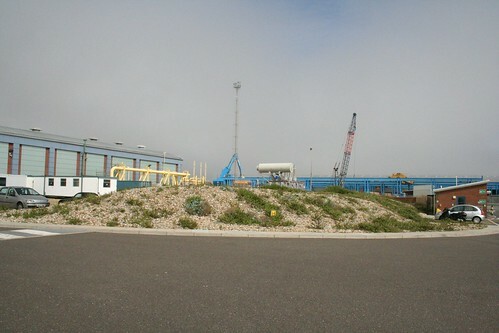 The tour was in two halves, with a talk about the site history (see above) and the issues that affect the running of the plant, then a walk around the place itself. Very sadly, no photos were allowed inside the building, for confidential reasons given to me afterwards that I can sympathise with, but we were free to photograph the outside. To be honest, you aren’t missing much as the building is really not much more than a gigantic shed with a vast metal box inside it that contains the generator turbines and is incredibly noisy. The power station is what is known as a combined cycle gas turbine (CCGT) station – where what is basically a gigantic jet engine is fed air and gas and spins at a very high speed to generate electricity. The hot gas that is blasted out and would ordinarily be used to push an aircraft forward is here channelled into a 7-story high water boiler and the steam generated is used to power three more generators. The “jet engine” generates 240MW of electricity and the steam turbines combine to add a further 160MW, bringing the plant up to 400MW in total. The second page of this pdf file explains how it works. The efficiency of converting gas into electricity is 58%, which compares to an average of 40% for coal plants. 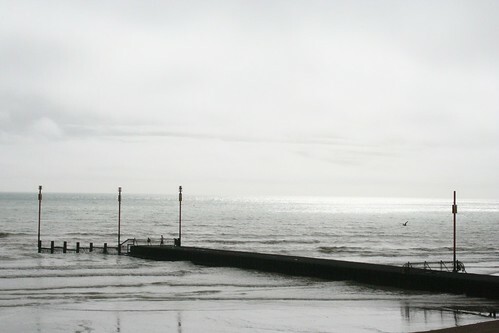 To condense the steam down to water again, they cool it using sea water, and the intake valve is a large concrete tube next to the sea shore, with water expelled a bit further down the shoreline, at about 10 degrees Celsius warmer. Inland power plants next to rivers can’t expel water as warm as that, which is why they have the distinctive cooling towers. Incidentally, the cooling towers emit just steam – so photos of electricity plants pollution illustrated by photos of cooling towers are very naughty. Sitting next to the power station itself is the familiar sight of a substation, and we could just see the three main cables that carry electricity from the station, around to a side building via some underground conduits and into another building. Here, there is a 180feet deep shaft that leads to a “tube tunnel” under the local harbour and over to another shaft on the other side where it plugs into the National Grid. Talking about the National Grid, when we were there the plant which can output 400MW was actually running on automatic control and wobbling around 300MW. In order to maintain the UK electricity supply at as close to 50Hz as possible, power output has to be adjusted continually – so while some power plants will be on full output, others are held in standby. Which do what and when is a commercial decision. When UK demand changes, then Shoreham would change its output as needed and we were shown some live graphs of that happening. You can also see how that fluctuation affects the UK as a whole via this live website. The UK famously has it’s TV show related kettle surge where the National Grid needs to bring on a load of power quickly just as the closing credits start to roll on the television screen. Another source of imbalance that is slowly starting to be felt is from the tiny amounts that people “feed-in” to the Grid from their domestic solar panels etc. Those are essentially a known unknown, and their unexpected wobbles have to be handled by the Grid. Paradoxically, wind power while variable, varies slowly enough that its deviations are not a significant issue. So, power is wobbling around and the power stations try to keep up. Over a period of a year, they are expected to maintain a level 50Hz. This is important in many areas, but especially with mains powered clocks, as their time is affected by the electricity supply. If they are running slow, then sometimes overnight the Grid will deliberately run “fast” in order to catch up. So if you wake up one morning feeling very tired – blame the National Grid as they might have knocked a few seconds off your clock overnight. Back to Shoreham, because of its location next to the sea, and in a secured area, they also act as a bit of a wildlife reserve for rare shingle plants, and what to me looked like just a pile of stones is actually a site of special scientific interest. I had guessed the tour might last maybe an hour or so, but we were actually there for over two hours, which also meant I missed my reserved train home (and the hoped for walk to Brighton), but it was worth it for a look around the place – and the talk. Going into the main plant building needed us to wear ear-plugs, which I kept. Might use them if I end up sitting next to someone with an iPod in the tube train. I’m impressed if you can hear someone else’s iPod over the noise of the the really! Good report, and great website! Good article except the Brighton B station worked up to 1986! The station was still running in 1981 when I did some training there. Loved your article on the Shoreham Power Plant! I live not too far and had no idea there had been tours. Would you be able to provide me with any contact information for me to set up a tour? Thank you so much! See the link in the opening paragraph.